As a speech-language pathologist working at Magee, I’ve had the opportunity to work with many individuals and families who have overcome obstacles and worked hard to improve their independence following a life-changing injury. Back in July of 2017, I had the opportunity to work with Tyler Trego. He came to Magee following a car accident in which he sustained a spinal cord injury (SCI) and traumatic brain injury (TBI). From day one, Tyler’s parents and siblings were by his side to support him through his recovery. 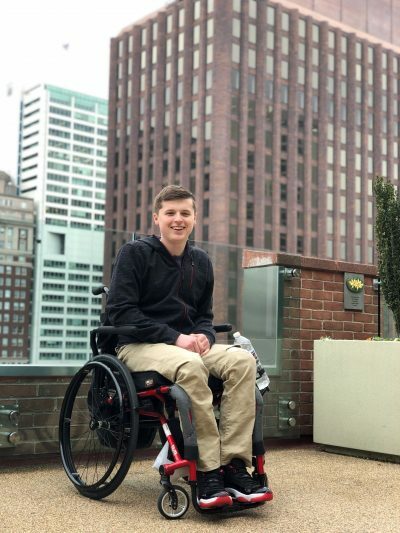 Although the early days of his recovery were challenging, Tyler was able to make a tremendous amount of progress during nearly three months at Magee. It was inspiring to see Tyler work hard, persevere, and increase his independence following his injury. Tyler always maintained a positive outlook and kept a smile on his face, even when challenges were presented to him. He was well-known throughout Magee by staff and fellow patients and continues to visit often. During one of his visits back to Magee, I was able to sit down with Tyler and his mom Cristi to talk with them about Tyler’s transition home and life after Magee. Ashley Shapero (AS): Tell us a little bit about yourself. Tyler Trego (TT): I’m just a 21-year-old guy who enjoys playing video games and sports. My favorite NFL football team is the Indianapolis Colts. Sorry, Philly! I played soccer when I was in high school. I currently live in Felton, DE with my mom, dad, brother, and sister. We also have two dogs that have way too much energy! AS: What brought you to Magee? TT: In June of 2017 I got into a car accident. My friend was driving and unfortunately fell asleep behind the wheel, which caused him to veer off the road. I ended up breaking my back in three places as a result of the accident, which left me with a T5 spinal cord injury. I also had a traumatic brain injury (TBI). After my accident, my parents had to look for a place for me to do my rehab in order to give me the best start to my recovery. After researching a few places, they came across Magee. The rest is history! I was at Magee from July to September of 2017. AS: What were the first few days of your stay at Magee like? TT: Since I was still feeling foggy and had trouble focusing in the beginning of my stay, it was initially hard for me to keep track of and remember the nurses and therapists that were coming to see me. Once I woke back up and started feeling like Tyler again, new friendships were formed, and I enjoyed my time with all of the staff throughout the three months I was here. AS: What did therapy at Magee teach you? TT: When I first came to Magee, I initially focused on everything I couldn’t do. After working with PT, OT, and speech therapy, I was able to see how much I actually could do, just in a different way than I was used to. I tried to stay positive throughout my recovery and reminded myself to focus on what I could do versus what I couldn’t. AS: Did you participate in any additional therapies while at Magee? TT: During the beginning of my stay, my mom kept bugging me to go up to the art studio. I didn’t really want to go at first. She eventually convinced me to go, and I enjoyed it so much that I started to go up on my own. I enjoyed art therapy because it showed me that there was still beauty in my brain that I could express and let out despite having an injury. AS: What advice would you give to someone just starting their recovery following a life-changing injury? TT: You’re going to want to focus on what you used to be able to do and what you can’t do anymore, but you can’t let your brain do that. Never forget where you came from. Regardless of what you went through, you’re still here and there is still a whole world to still explore. It’s the same world with the same people who care about you that you can have a good time with and make memories with. You have to conquer from within! AS: What are you up to now? Tell us about life after Magee. TT: For the first year after my accident, all I really did was hang out with friends and play video games. Then I realized that life was still happening around me! One day, an individual from Dover Downs casino reached out to me and offered me a job in VIP services as a call agent. I currently work there three days a week. It’s a great job that keeps me thinking. My brain hurts when I come home! On my days off, I like to go to the gym, hang out with friends, and attend church. Next thing on my list is getting my license and being able to drive! I think this will be emotional for me because of my experience and because I’ve seen what damage a car can do, but I’m excited to work towardthat level of independence. To learn more about the Brain Injury Program at Magee, click here.